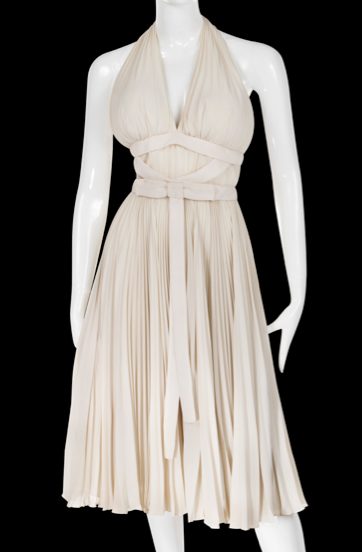 LOS ANGELES- DATE- Profiles in History is proud to announce Essentially Marilyn: The Auction/The Exhibit, an exhibit of costumes & artifacts from the extraordinary life & career of Marilyn Monroe. The exhibit will be at The Paley Center for Media in Beverly Hills, August 18th – September 30th. All the items will be going up for auction at the end of October, date to be announced. Highlights of the exhibit are below. A major Marilyn Monroe mystery has been solved! For years it had been debated, how did she get her name? A never before seen oversize presentation photograph inscribed by Marilyn Monroe to 20th Century Fox studio executive, Ben Lyon, answers that question. Marilyn inscribes, “Dear Ben, You found me, named me and believed in me when no one else did. My thanks and love forever. Marilyn” The photo was taken during the filming of The Seven Year Itch. This is the most important signed photograph in Hollywood history. Fifteen costumes worn by Marilyn Monroe will be on exhibit, including her yellow and black sequined showgirl costume from Gentlemen Prefer Blondes (pictured below), her signature white chiffon over white satin ball gown from The Prince and the Showgirl, her patterned sequined dress from How to Marry a Millionaire and the “Subway Dress” from The Seven Year Itch that was created by Bill Travilla, who made most of Marilyn’s costumes, for touring and exhibition purposes. It’s made to the exact specifications of his original 1955 design for the film. It’s pictured right. Marilyn’s heavily hand-annotated script from 1955’s The Seven Year Itch, which gives unique insight into her artistic process. The exhibit will be framed by elegant and stunningly beautiful large format photographs of Monroe captured by her friend, famed fashion and celebrity photographer Milton H. Greene. Pictured above. Founded in 1985 by Joseph Maddalena, Profiles in History is the world’s largest auctioneer & dealer of original Hollywood Memorabilia, historical autographs, letters, documents, vintage signed photographs and manuscripts. Born into a family of antiques dealers in Rhode Island, Joseph “Joe” Maddalena learned early on how to turn his passion of collecting historical autographs into a career. Upon graduation from Pepperdine, Joe pursued his passion to become a full-time dealer of historical documents, and opened his first office in 1985. Profiles in History has held some of the most prestigious and successful auctions of Hollywood memorabilia and own virtually every Guinness Book record for prices of original screen-used memorabilia. Highlights from their previous auctions include the “Cowardly Lion” costume from The Wizard of Oz for $805,000; Steve McQueen’s “Michael Delaney” racing suit from Le Mans for $960,000; From the history-making Debbie Reynolds Auction in June 2011, Profiles in History sold the Marilyn Monroe “Subway” Dress from The Seven Year Itch for $5.52M and the Audrey Hepburn Ascot Dress from My Fair Lady for $4.44M. In February 2012, Profiles in History arranged the sale of a pair of Judy Garland screen-used Ruby Slippers from The Wizard of Oz to the Academy of Motion Picture Arts & Sciences. In June 2017, at his Hollywood Auction 89, Joe sold the Gary Cannavo collection of Battlestar Galactica spaceships for 1.8 million dollars, the Saturday Night Fever dance floor for 1.2 million and an R2D2 for 2.76 million. In May 2018, Joe sold the Big Book of Alcoholics Anonymous for 2.4 million. In addition, Joe Maddalena was the star of Hollywood Treasure, which aired on Syfy. Hollywood Treasure took viewers into the fascinating world of showbiz and pop culture memorabilia. The Paley Center for Media, a 501(c)(3) nonprofit organization with locations in New York and Los Angeles, leads the discussion about the cultural, creative, and social significance of television, radio, and emerging platforms. Drawing upon its curatorial expertise, an international collection, and close relationships with the leaders of the media community, the Paley Center examines the intersections between media and society. The general public can access the Paley Center’s permanent media collection which contains over 160,000 television and radio programs and advertisements, and participate in programs that explore and celebrate the creativity, the innovations, the personalities, and the leaders who are shaping media. Through the global programs of its Media Council and International Council, the Paley Center also serves as a neutral setting where media professionals can engage in discussion and debate about the evolving media landscape. Previously known as The Museum of Television & Radio, the Paley Center was founded in 1975 by William S. Paley, a pioneering innovator in the industry. For more information, please visit paleycenter.org.